© Greenspoon et al. ; Licensee Bentham Open. Tendon transfers can be a surgical treatment option in managing younger, active patients with massive irreparable rotator cuff tears. The purpose of this article is to provide an overview of the use of tendon transfers to treat massive irreparable rotator cuff tears and to summarize clinical outcomes. A selective literature search was performed and personal surgical experiences are reported. Latissimus dorsi transfers have been used for many years in the management of posterosuperior rotator cuff tears with good reported clinical outcomes. It can be transferred without or with the teres major (L’Episcopo technique). Many surgical techniques have been described for latissimus dorsi transfer including single incision, double incision, and arthroscopically assisted transfer. Transfer of the pectoralis major tendon is the most common tendon transfer procedure performed for anterosuperior rotator cuff deficiencies. Several surgical techniques have been described, however transfer of the pectoralis major beneath the coracoid process has been found to most closely replicate the force vector that is normally provided by the intact subscapularis. Tendon transfers can be used successfully in the management of younger patients with massive irreparable rotator cuff tears and minimal glenohumeral arthritis. Improvements in clinical outcomes scores and range of motion have been demonstrated. This can delay arthroplasty, which is of particular importance for younger patients with high functional demands. Keywords: Irreparable rotator cuff tear, Latissimus dorsi tendon transfer, Massive rotator cuff tear, Pectoralis major tendon transfer, Rotator cuff tear, Tendon transfer. Tears of the rotator cuff are a common cause of shoulder pain and dysfunction. Although the prevalence of rotator cuff tears increase with age, not all patients develop symptoms necessitating surgery, and many patients benefit from conservative management . However, if symptoms persist, surgery can provide significant pain relief and improvements in function across many patient ages and demographics [2-4]. Massive rotator cuff tears are particularly challenging to manage clinically, which is concerning given that they have a reported prevalence to be as high as 40% of all rotator cuff tears . One difficulty is that many classification systems have been proposed to assist in the evaluation and treatment of massive cuff tears, however, no consensus currently exists [6, 7]. A commonly used classification system is one originally proposed by DeOrio and Cofield which defines a massive tear as one that is greater than 5 centimeters in size . A classification system used often in Europe was one defined by Gerber in which a rotator cuff tear is considered massive if it is a full thickness tear involving at least two tendons . A recent classification system proposed by Davidson and Burkhart links rotator cuff tear patterns to treatment and prognosis . Millett and Warth emphasize that it is crucial that management of the patient with a rotator cuff tear be based on an interpretation of the clinical situation and patient presentation . Another challenge when treating massive tears is that several studies have indicated a higher rate of structural failure of repairs when compared to smaller tears . However, it is important to note that even patients with retears noted postoperatively on magnetic resonance imaging (MRI) had significantly improved function and pain. Therefore, it has to be emphasized that structural failure does not necessarily equate to a clinical failure. Many surgical treatment options exist for managing massive tears, including arthroscopic debridement with a biceps tenotomy or tenodesis, complete repair if the rotator cuff tendon is of good quality and not severely retracted, partial repair, use of an allograft patch to augment a repair or to bridge over a defect, superior capsular reconstruction, muscle tendon transfer, and reverse total shoulder arthroplasty [5, 11]. The purpose of this article is to highlight the indications and clinical outcomes of muscle tendon transfers in the treatment of massive irreparable rotator cuff tears. Nonoperative management should be tried prior to any surgical interventions. Patients are more likely to have a successful outcome with nonoperative management if their symptoms are primarily related to function rather than pain. Activity modification, corticosteroid injections, and strengthening of the surrounding musculature can be helpful . Another manuscript of this thematic issue focuses on non-operative treatment for rotator cuff tears in detail. If patients fail to achieve a satisfactory outcome, surgical treatment should be considered. A complete anatomic repair of the rotator cuff should be performed when possible. If there are concerns regarding the strength of the repair or healing potential, allograft patches can be used to augment the repair. However, repair is not always possible with massive rotator cuff tears due to poor tissue quality, tendon loss, fatty infiltration and atrophy of the rotator cuff muscles, or significant tendon retraction. In select cases with the aforementioned attributes, partial repair can be performed. Partial repair of the rotator cuff was described by Burkhart as a method to restore the force couples of rotator cuff tendons thereby improving function [13, 14]. If the tendons cannot be repaired, debridement can be used to provide pain relief and partly improve function. Debridement and biceps tenotomy or tenodesis are best suited for elderly patients with limited functional goals who are seeking pain relief [5, 15]. Comprehensive information about debridement procedures for rotator cuff tears are discussed in a separate article in this thematic issue. Reverse total shoulder arthroplasty has been used successfully in patients with massive rotator cuff tears. Reverse total shoulder arthroplasty should be considered in an older patient with a massive rotator cuff tear and concomitant osteoarthritis. Concerns regarding implant longevity make reverse total shoulder arthroplasty a less desirable option in younger patients as revision procedures are challenging and outcomes less predictable . Therefore, in younger active patients with minimal glenohumeral arthritis and severe functional limitations, superior capsule reconstruction or tendon transfer should be considered. Mihata et al. recently described a technique known as superior capsule reconstruction that uses a fascia lata autograft to reconstruct the superior capsule of the shoulder joint . Superior capsule reconstruction can also be done using acellular dermal allografts. This technique shows promising early clinical results . An alternative treatment approach consists of a tendon transfer. Latissimus dorsi tendon transfers with or without the teres major have been used to restore function in patients with massive rotator cuff tears affecting the posterosuperior cuff tendons [17, 18]. Pectoralis major transfers can be used to restore glenohumeral function when there is an irreparable anterosuperior rotator cuff tear [19-22]. Transfers of the latissimus dorsi tendon are the most frequently reported of all tendon transfers. The latissimus dorsi tendon has a large muscle excursion making it a good candidate for muscle transfer . It can be transferred without or with the teres major (L’Episcopo technique). Many surgical techniques have been described for latissimus dorsi transfer including single incision, double incision, and arthroscopically assisted transfer [23-25]. When the latissimus dorsi tendon is transferred to the greater tuberosity, it functions as an external rotator and humeral head depressor, assuming the roles of the posterosuperior cuff tendons . Depression of the humeral head improves biomechanics and creates a better fulcrum for glenohumeral motion. The patient is placed in the modified beach chair position with a pneumatic arm holder. Diagnostic arthroscopy is performed to directly assess the rotator cuff tendons. If parts of the rotator cuff can be repaired, it is done at this time. The arm is then abducted and a curvilinear incision is made posteriorly and laterally following the lateral border of the latissimus dorsi muscle belly (Fig. 1). When the insertion site of the latissimus tendon at the humerus is recognized, the tendon is harvested at this site. It is important to identify the neurovascular pedicle of the latissimus dorsi muscle belly. The muscle belly is freed entirely making sure that it is mobile enough to reach the top of the acromion (Fig. 2). The patient is placed in the modified beach chair position. The marking of the curvilinear incision necessary to perform the procedure is indicated. The latissimus tendon is released from the insertion site on the humerus. The muscle belly is meticulously dissected with caution being taken to avoid the neurovascular pedicle. A 3 mm acellular dermal allograft is used to augment the native latissimus tendon. It is sewed in place with #2 sutures (Fig. 3). A soft tissue tunnel underneath the deltoid and posterior to the teres minor is created and dilated. If the rotator cuff could not be repaired arthroscopically, it is repaired as much as possible at this time. 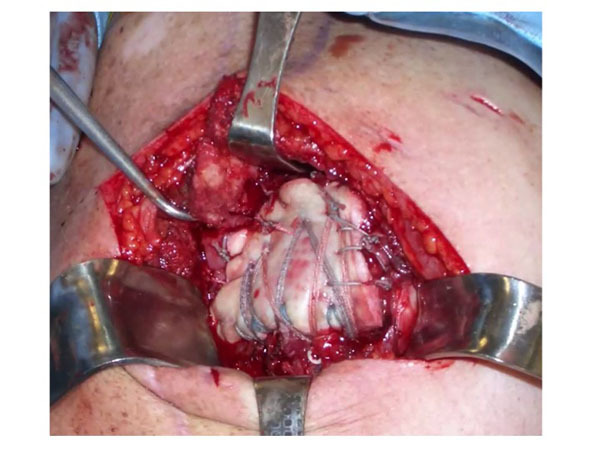 The latissimus tendon is freed and augmented with an acellular dermal allograft. The arm is placed in 30 degrees of abduction, 30 degrees of forward flexion, and 30 degrees of external rotation. The graft is placed on the lateral aspect of the greater tuberosity so that it creates an external rotation moment to assist in external rotation of the shoulder. The acellular dermal allograft is then incorporated into the rotator cuff repair. It is sewn to the remaining native rotator cuff tissue, including the teres minor posteriorly. It is also attached to the subscapularis and the biceps tendon sheeth anteriorly. The final repair should demonstrate complete closure of the rotator cuff and reattachment of the latissimus dorsi tendon (Figs. 4, 5a, 5b). The final repair is visualized. The latissimus dorsi is attached to the greater tuberosity and the final repair shows closure of the rotator cuff. 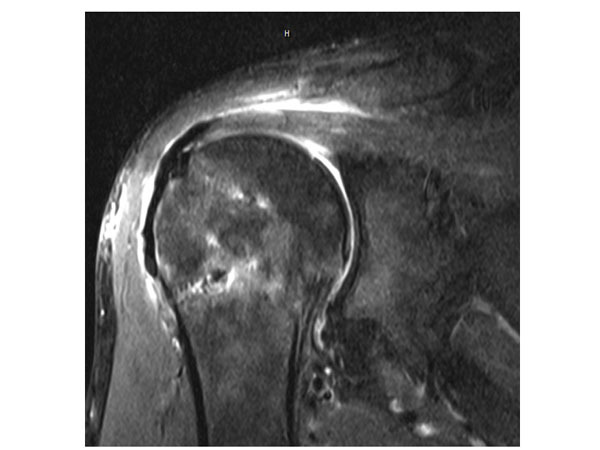 Preoperative MRI in a 43 year old active male individual showing a massive posterosuperior rotator cuff tear retracted to the level of the glenoid. Postoperative MRI demonstrating closure of the rotator cuff. Many studies have analyzed the clinical outcomes of latissimus dorsi tendon transfers which are summarized in Table 1, [17, 18, 24, 27-42]. In general, a significant improvement in pain and function were noted. A systematic review conducted by Namdari et al. evaluated 10 studies in an effort to identify predictive factors for success and complications following surgery . The overall reported complication rate was 9.5% and included events such as infection, neurapraxia, failures of the deltoid repair, hematomas, wound dehiscence and tears of the transferred tendon. The authors concluded that clinical outcomes are better in patients who have a lower degree of teres minor fatty atrophy, are undergoing a primary surgery, and have an intact subscapularis tendon. Moursy et al. found that including a small piece of bone with the latissimus dorsi when doing the transfer led to a decrease in tears of the transferred tendon postoperatively . Castricini et al. reported similar results to previously published studies despite using an arthroscopically assisted latissimus dorsi technique . They did note decreased strength and Constant scores in revision surgeries compared to primary surgeries . A recent study by Plath et al. indicated that an inferior ASES score was associated with latissimus dorsi coactivation, measured as electromyographic activity when being used for its new function of external rotation as well as activation during the muscles original functions . Summary of studies reporting clinical outcomes of latissimus dorsi tendon transfer for rotator cuff tears. Two studies were recently published looking at the long term clinical results following latissimus dorsi transfer [17, 18]. Gerber et al. reported on 46 shoulders in 44 patients with a minimum follow up of ten years . There were significant improvements in the relative Constant score (56% to 80%), Subjective Shoulder Value (29% to 70%), and pain levels. In addition, significant improvements in range of motion for flexion (118˚ to 132˚), abduction (112˚ to 123˚) and external rotation (18˚ to 33˚) were noted . Similar to the findings of Namdari et al., inferior results were noted in patients with subscapularis insufficiency and high degrees of fatty infiltration of the teres minor muscle [18, 43]. Superior functional results were seen in shoulders with a smaller postoperative critical shoulder angle . El-Azab and colleagues reported on 93 shoulders in 86 patients with a mean duration of follow up of 9.3 years . In accordance with the results of Gerber et al., they reported improvements in the relative Constant score (44% to 71%) [17, 18]. In addition, significant improvements found in the American Shoulder and Elbow Surgeon’s score (30 to 70) as well as the mean visual analog scale used for assessing pain . The rate of clinical failure of latissimus dorsi transfer was 10%, and 4% of patients progressed to a shoulder arthroplasty during the follow up period . Lichtenberg et al. investigated differences in clinical outcomes between isolated latissimus dorsi transfer and combined transfer of the latissimus dorsi and teres major (L’Episcopo technique) . Seventeen patients were in each group. After a mean follow-up of 6 years, there were significant improvements in Constant scores in each group as well as improvements in active range of motion . However, when range of motion was compared between the two groups, the patients who had an isolated latissimus dorsi transfer had significantly better active flexion and abduction. Furthermore, progression of cuff tear arthropathy was not observed with the isolated latissimus dorsi transfer . The results of the clinical studies indicate that transfer of the latissimus dorsi tendon is a reasonable surgical procedure in treating patients with massive posterosuperior rotator cuff tears. Patients can be counseled to expect decreased shoulder pain and improved glenohumeral function. Transfer of the pectoralis major tendon is the most common tendon transfer procedure performed for anterosuperior rotator cuff deficiencies. Several surgical techniques have been described, however transfer of the pectoralis major beneath the coracoid process has been found to most closely replicate the force vector that is normally provided by the intact subscapularis . Concerns regarding injury to the musculocutaneous nerve led Gerber et al. to use a split pectoralis major transfer which creates favorable force vector without the need to go under the conjoined tendon . The patient is placed in the modified beach chair position and the extremity is prepped and draped in the usual sterile fashion. Diagnostic arthroscopy followed by glenohumeral debridement is performed. The subscapularis is inspected and if deemed irreparable, the diagnostic component of the surgery is concluded. The deltopectoral approach is established and the cephalic vein identified. The sternal and clavicular heads of the pectoralis major are identified and separated. The sternal head is harvested at its humeral attachment site and transferred underneath the clavicular portion of the pectoralis major muscle. The conjoined tendon is elevated allowing for identification of the torn subscapularis and the lesser tuberosity. If an inferior sling of the muscular portion of the subcapularis is present, it can be mobilized and incorporated into the repair. All soft tissue is removed from the lesser tuberosity to create a bleeding bed to promote healing. A double row repair of the transferred tendon to the lesser tuberosity is performed with at least two anchors medially and laterally. Several studies have reported on the clinical outcomes of pectoralis major transfers (Table 2), [19-21, 46-48]. Resch et al. reported improvements in the Constant score from 22.6 preoperatively to 54.5 at an average follow up of 28 months . Active flexion improved from an average of 93 degrees to 129 degrees and active abduction improved from an average of 85 degrees to 113 degrees at the time of follow up . In a series involving 30 pectoralis major transfers, Jost et al. indicated a mean relative Constant score increase from 47% preoperatively to 70% at 32 months follow up . There was also improvement in activities of daily living, range of forward flexion, pain, and abduction strength. Importantly, in patients with irreparable supraspinatus tendon tears, the outcomes were less positive . 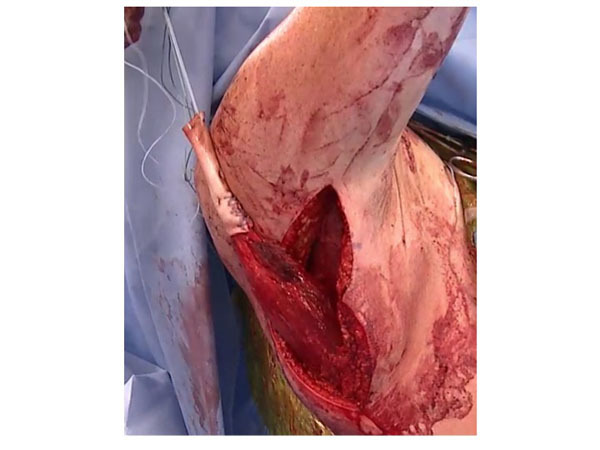 There were 6 postoperative complications, including avulsion of the transferred tendon, rerupture of the supraspinatus and infraspinatus, infection, deep vein thrombosis of the axillary vein, and a mechanical issue involving the coracoid process and the humeral head . Galatz et al. reported improvements in patients with massive rotator cuff insufficiency leading to anterosuperior subluxation that underwent pectoralis major transfers . The mean ASES score improved from 27.2 preoperatively to 47.7 at an average follow up of 17.5 months. Improvements in pain and function were also reported by Gavriilidis et al. in 15 patients at an average of 37 months follow up . Less favorable outcomes have been reported in patients who had concomitant irreparable supraspinatus tears in addition to irreparable subscapularis tears . A systematic review found that patients who underwent a subcoracoid transfer as opposed to a supracoracoid transfer had significantly higher Constant scores . Transfer of the pectoralis major muscle-tendon-unit is a reasonable surgical option for managing irreparable anterosuperior rotator cuff tears. However, more studies are needed to identify the best surgical technique and ideal patients for the procedure. Summary of studies reporting clinical outcomes following pectoralis major tendon transfer for rotator cuff tears. This research was supported by the Steadman Philippon Research Institute. The Institute receives research support from the following entities: Smith & Nephew Endoscopy, Inc.; Arthrex, Inc.; Siemens Medical Solutions USA, Inc.; Ossur Americas, Inc.; Opedix, Inc. This work was not supported directly by outside funding or grants. Dr. Peter J. Millett has received from Arthrex something of value (exceeding the equivalent of US$500) not related to this manuscript or research. He is a consultant and receives payments from Arthrex and has stock options in GameReady and Vumedi. Dr. Maximilian Petri had his research position at the Steadman Philippon Research institute funded by Arthrex. The other authors receive support from the Steadman Philippon Research Institute. Fehringer EV, Sun J, VanOeveren LS, Keller BK, Matsen FA III. Full-thickness rotator cuff tear prevalence and correlation with function and co-morbidities in patients sixty-five years and older. J Shoulder Elbow Surg 2008; 17(6): 881-5. Ames JB, Horan MP, Van der Meijden OA, Leake MJ, Millett PJ. Association between acromial index and outcomes following arthroscopic repair of full-thickness rotator cuff tears. J Bone Joint Surg Am 2012; 94(20): 1862-9. Bhatia S, Greenspoon JA, Horan MP, Warth RJ, Millett PJ. Two-year outcomes after arthroscopic rotator cuff repair in recreational athletes older than 70 years. Am J Sports Med 2015; 43(7): 1737-42. Vaishnav S, Millett PJ. Arthroscopic rotator cuff repair: scientific rationale, surgical technique, and early clinical and functional results of a knotless self-reinforcing double-row rotator cuff repair system. J Shoulder Elbow Surg 2010; 19(2)(Suppl. ): 83-90. Bedi A, Dines J, Warren RF, Dines DM. Massive tears of the rotator cuff. J Bone Joint Surg Am 2010; 92(9): 1894-908. DeOrio JK, Cofield RH. Results of a second attempt at surgical repair of a failed initial rotator-cuff repair. J Bone Joint Surg Am 1984; 66(4): 563-7. Millett PJ, Warth RJ. Posterosuperior rotator cuff tears: classification, pattern recognition, and treatment. J Am Acad Orthop Surg 2014; 22(8): 521-34. Galatz LM, Ball CM, Teefey SA, Middleton WD, Yamaguchi K. The outcome and repair integrity of completely arthroscopically repaired large and massive rotator cuff tears. J Bone Joint Surg Am 2004; 86-A(2): 219-24. Mihata T, Lee TQ, Watanabe C, et al. Clinical results of arthroscopic superior capsule reconstruction for irreparable rotator cuff tears. Arthroscopy 2013; 29(3): 459-70. Burkhart SS, Nottage WM, Ogilvie-Harris DJ, Kohn HS, Pachelli A. Partial repair of irreparable rotator cuff tears. Arthroscopy 1994; 10(4): 363-70. Williams GR Jr, Rockwood CA Jr, Bigliani LU, Iannotti JP, Stanwood W. Rotator cuff tears: why do we repair them? J Bone Joint Surg Am 2004; 86-A(12): 2764-76. 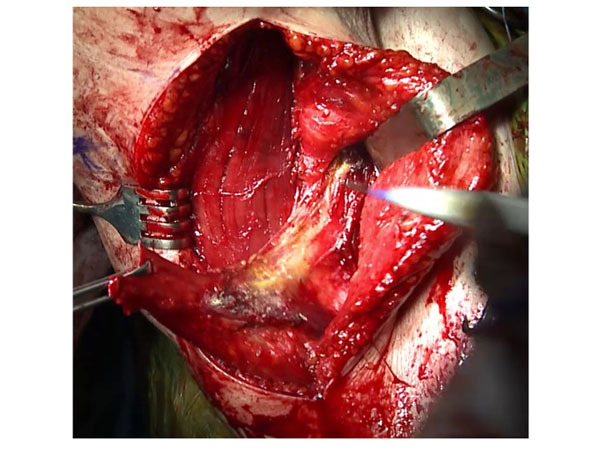 Guery J, Favard L, Sirveaux F, Oudet D, Mole D, Walch G. Reverse total shoulder arthroplasty. Survivorship analysis of eighty replacements followed for five to ten years. J Bone Joint Surg Am 2006; 88(8): 1742-7. Galatz LM, Connor PM, Calfee RP, Hsu JC, Yamaguchi K. Pectoralis major transfer for anterior-superior subluxation in massive rotator cuff insufficiency. J Shoulder Elbow Surg 2003; 12(1): 1-5. Gerber A, Clavert P, Millett PJ, Holovacs TF, Warner JJ. Split pectoralis major and teres major tendon transfers for massive irreparable tears of the subscapularis. Tech Shoulder Elbow Surg 2004; 5: 5-12. Jost B, Puskas GJ, Lustenberger A, Gerber C. Outcome of pectoralis major transfer for the treatment of irreparable subscapularis tears. J Bone Joint Surg Am 2003; 85-A(10): 1944-51. Konrad GG, Sudkamp NP, Kreuz PC, Jolly JT, McMahon PJ, Debski RE. Pectoralis major tendon transfers above or underneath the conjoint tendon in subscapularis-deficient shoulders. An in vitro biomechanical analysis. J Bone Joint Surg Am 2007; 89(11): 2477-84. Millett PJ, Yen Y, Huang MJ. Arthroscopically assisted latissmusdorsi transfer for irreparable rotator cuff tears. Tech Shoulder Elbow Surg 2008; 9(2): 76-9. Petri M, Greenspoon JA, Bhatia S, Millett PJ. Patch-augmented latissimusdorsi transfer and open reduction internal fixation of unstable osacromiale for irreparable massive posterosuperior rotator cuff tear. Arthrosc Tech 2015; 4(5): e487-92. Castricini R, Longo UG, De Benedetto M, et al. Arthroscopic assisted latissimusdorsi transfer for the management of irreparable rotator cuff tears: short-term results. J Bone Joint Surg Am 2014; 96(14): e119. 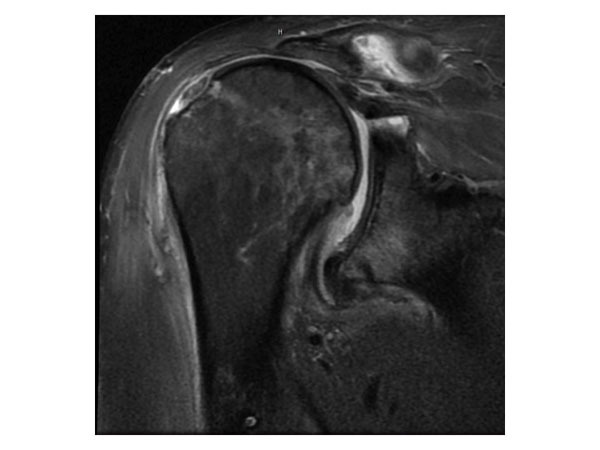 Lehmann LJ, Cafaltzis K, Hünnebeck S, Moursy M. Are there any prognostic prediction parameters (PPPs) in the treatment of the massive rotator cuff tear with latissimus dorsi transfer? Latissimus dorsi transfer in massive rotator cuff tears. Acta Chir Orthop Traumatol Cech 2013; 80(2): 125-30. Warner JJ, Parsons IM IV. Latissimus dorsi tendon transfer: a comparative analysis of primary and salvage reconstruction of massive, irreparable rotator cuff tears. J Shoulder Elbow Surg 2001; 10(6): 514-21. Plath JE, Seiberl W, Beitzel K, et al. Electromyographic activity after latissimus dorsi transfer: testing of coactivation as a simple tool to assess latissimus dorsi motor learning. J Shoulder Elbow Surg 2014; 23(8): 1162-70. Lichtenberg S, Magosch P, Habermeyer P. Are there advantages of the combined latissimus-dorsi transfer according to L’Episcopo compared to the isolated latissimus-dorsi transfer according to Herzberg after a mean follow-up of 6 years? A matched-pair analysis. 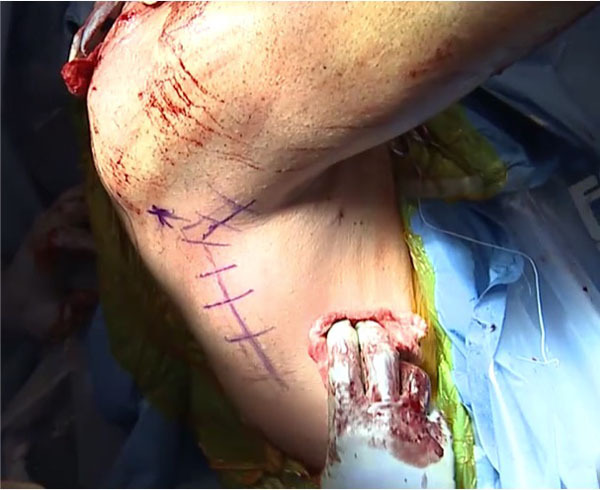 J Shoulder Elbow Surg 2012; 21(11): 1499-507. Gavriilidis I, Kircher J, Magosch P, Lichtenberg S, Habermeyer P. Pectoralis major transfer for the treatment of irreparable anterosuperior rotator cuff tears. Int Orthop 2010; 34(5): 689-94. Resch H, Povacz P, Ritter E, Matschi W. Transfer of the pectoralis major muscle for the treatment of irreparable rupture of the subscapularis tendon. J Bone Joint Surg Am 2000; 82(3): 372-82. Elhassan B, Ozbaydar M, Massimini D, Diller D, Higgins L, Warner JJ. Transfer of pectoralis major for the treatment of irreparable tears of subscapularis: does it work? J Bone Joint Surg Br 2008; 90(8): 1059-65.